Vivian Hoffman, 94, of Syracuse, died Monday, June 4, 2012 at the Jewish Home of Central New York at Menorah Park. Born in New York City, she was the daughter of the late Samuel and May Kronenberg. She was a former member of Temple Adath Yeshurun, Sisterhood, and past president of Hadassah. Before retiring, Vivian worked as an administrator at the Gerontology Center, at the School of Social Work at Syracuse University. She was predeceased by her husband, Oscar Hoffman, in 2003. Survived by her stepsons, Gilbert (Brenda) Hoffman, and Alan (Beth) Hoffman; step-grandchildren, Brian, Hilary, Dorothy, and Frances; and nieces, Elaine Dubroff and Joyce Golden. 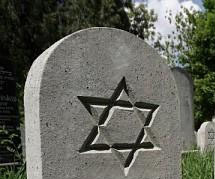 Graveside services and burial will be conducted 10 a.m. on Wednesday, June 6, 2012 at Adath Yeshurun Cemetery. There will be no calling hours. Contributions may be made to Temple Adath Yeshurun, 450 Kimber Rd., Syracuse, NY 13224.